Anthony Joshua is looking forward to get good results in the upcoming boxing fight. He become a world heavyweight champion with in few years. His next opponent is from Bulgaria (Kubrat Pulev) who is quite strong with his jaw punching tricks. 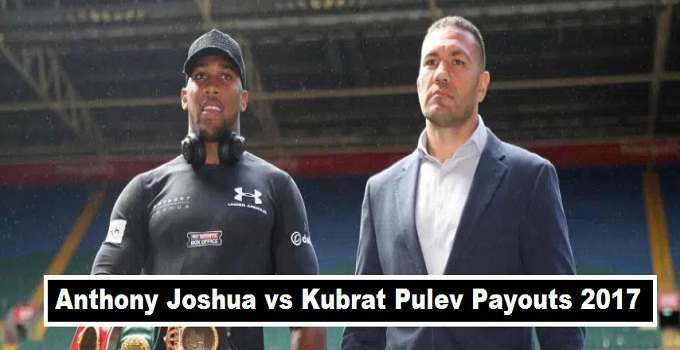 How much Kubrat Pulev earn from his fight with Joshua. There are rumors that more then 70,000 tickets were sold for the heavyweight championship match on 28th October which means there will be a huge crowed at Millennium Stadium where a crowed sitting capacity is upto (74,500) people at one time. Anthony Joshua made big money from his previous fight with in 2017 with (Wladimir Klitschko), according to sources of boxing that claimed Joshua get paid (£15 Million) as purse split between both boxers. This fight is also big one but so far there are no updates how much Joshua get paid in split of purse will it be (50/50) or (60/40) among both boxers. The expected amount that Anthony Joshua earned from his fight will be closer (£15 million). There is huge increase in the fan following of the British boxer allot of people were expecting him to win the fight against (Cobra). Joshua will be defending his (WBA Super, IBF, and IBO heavyweight titles) in the PPV fight. Kubrat Pulev has promised recently that he would hand over his half of the purse money to the charity if he will become the first heavyweight boxers to stop Anthony Joshua in October 2017. Joshua is undefeated in his all 19 fights and mostly dominated his opponent in the ring. Well on 28 October we have the winner of the match.